Major Theme Park to use Titan Shake. Titan Shake is the composite roofing material of choice for a major theme park in the United States. The new shake roofs were chosen over the competition due to their authentic looks, superior performance, and custom color capabilities. The theme park also stated that Titan was chosen for its natural appearance, color capabilities, and the fact that it is the only fully sustainable product they could locate. This theme park is very dedicated to the environment and is proud to be using "green" products. A New Color in the Old World Spanish A4 profile. Titan has a new color offering in its Old World Spanish A4 tile. "Clay red is going to fit nicely with our current offerings" comments Titan president, Billibob Boor. "It fills a need for our clients to have an alternative that will fall between our lighter French Clay and Dark Terra Cotta. Plus, the new clay red is an exact match to natural clay." Titan Slate sports Realistic Finish with Solid Tile Accessory. Luxury condominium complex in Orlando, FL chooses Titan Products. American Leisure has contracted Resorts Construction for the development of a luxury condominium complex in Orlando, FL. They choose Titan Old World Spanish Tile for its authentic appearance and custom color capabilities. The complex’s designer desired the look of old European clay; Titan helped to achieve that goal and with the added benefit of using an environmentally friendly roofing product. 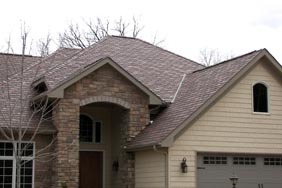 Titan Roof Systems Shake installation manual has been updated. Installers, you can download your own copy – go to the Shake Roofing page and click on the installation link.